Fabric Mart Fabricistas: Made by a Fabricista: Travel Perfect Pants (in Teal), a Floral Blouse, and a Retro Hawaiian Inspired Dress. 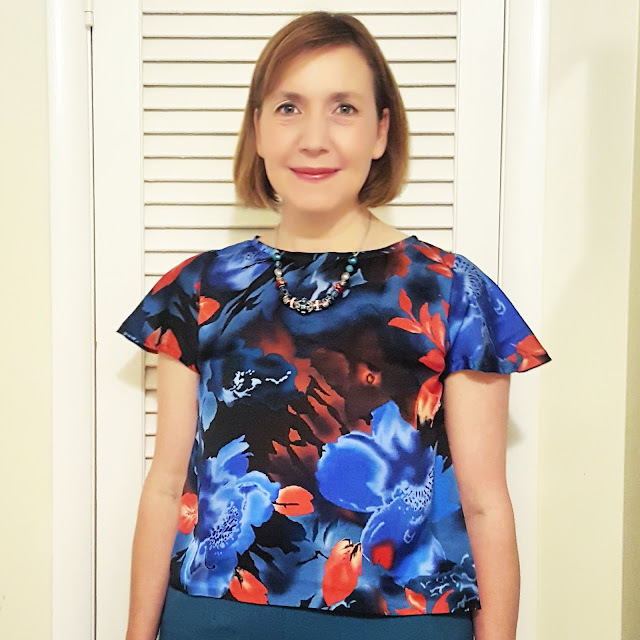 Made by a Fabricista: Travel Perfect Pants (in Teal), a Floral Blouse, and a Retro Hawaiian Inspired Dress. I decided that I would make an old favorite for my May post. A couple of years ago, I wanted to nail down pants fitting, so I labored over a Palmer-Pletsch pattern (McCalls 6901) and came away with a perfectly fitting pair of pants for all my hard work. I will tell you, since then, I have worn those gorgeously fitted pair of ponte pants again and again and again. I wear them at least twenty times in the correct seasons, and almost every trip I take I bring them with me. 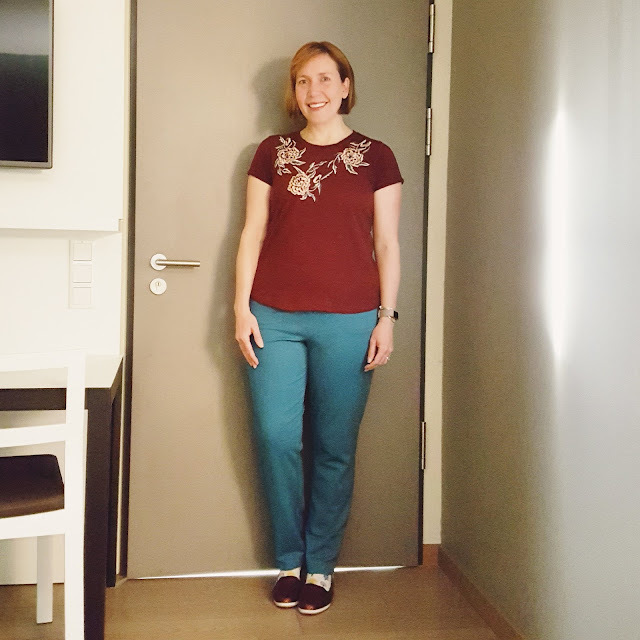 Since we were headed to Germany, Denmark, and Poland this April for spring break, I knew I wanted to not only bring my beloved black perfect pants, but also bring a more colorful pair with me, too. 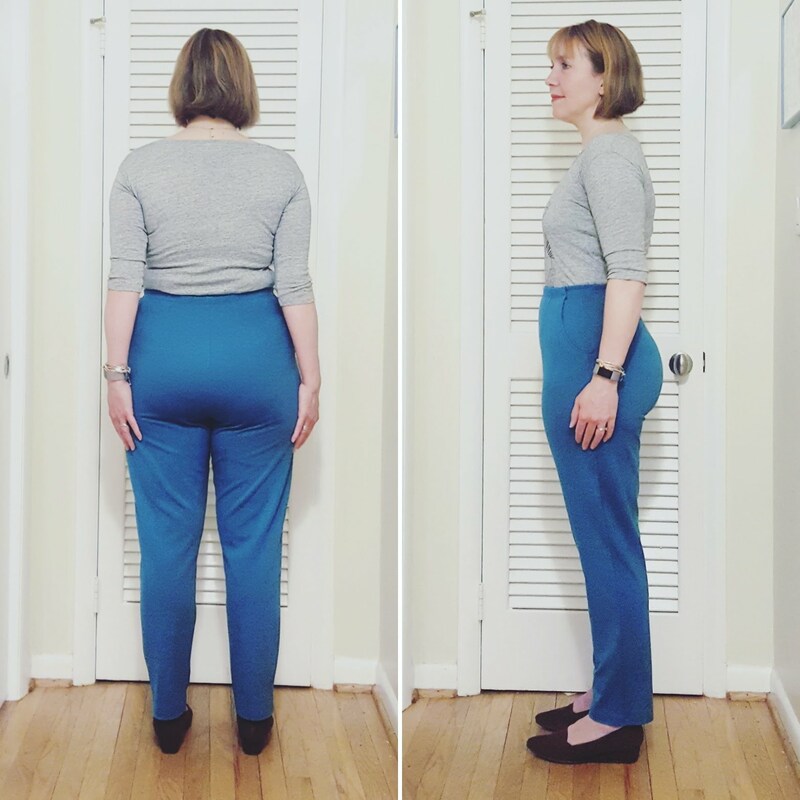 So I arranged to receive a nice long piece of teal viscose/nylon/lycra ponte knit fabric from Fabric Mart to make my new perfect pants from, and the results were as wonderful as the first pair...and I am elated! 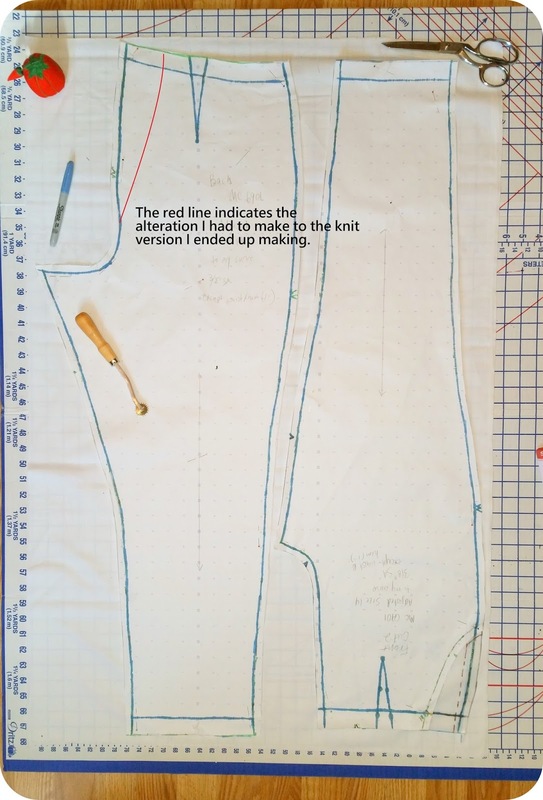 I could have just cut away at the crotch curve that I knew would fit, but being Miss Persnickety, I decided it was better, just in case, to use the woven version's crotch curve when cutting, fit to the body, and then cut to the curve as need be. Well, the need was still there, and just like with the black pair, it fits exactly right. Yay for consistency! I did notice that with a lighter color that you can see the wrinkles and saggy bits a touch more than in the black pair, but considering how I have seen pants look on me when the fit is really off (UGH), I am completely fine with a tiny wrinkle here or there. LOL. These pants wore well and match SO much in my closet. I love this color teal, I wear it all the time. 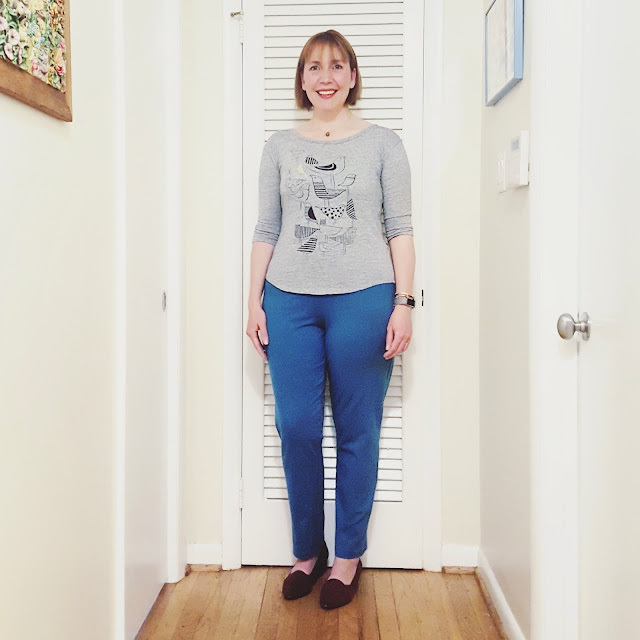 The fabric these new pants were made from is gone, but there is some gorgeous (viscose)rayon/nylon/lycra still available in blue, black, mauve, and a grey-blue, so if you have a hankering for a pair of pants you'll wear constantly, I highly recommend a few yards of that for your stash. Since I can't just stop at one project, I also added a top to my "must do" list, and asked to have a Julie's Pick from March be sent to me to make a new top from. This fabric has a bunch of deep jewel tones in it, as well as the exact shade of teal that the pants are. 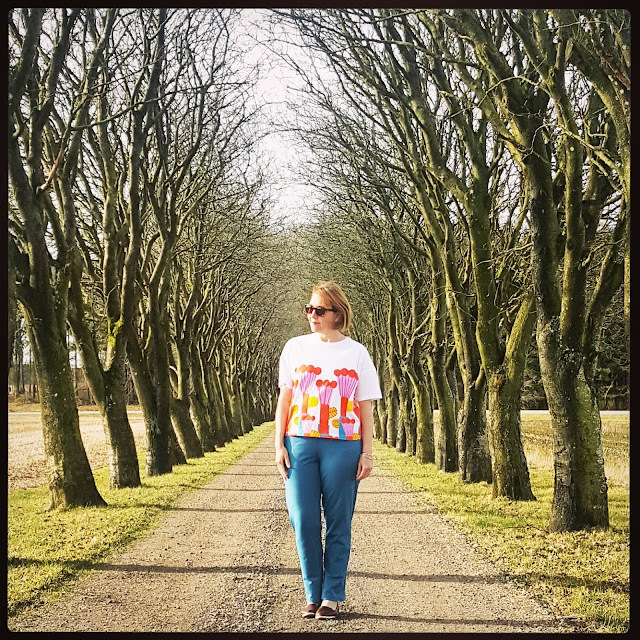 It is a floral poly charmeuse and is just lovely with the pants. It is a bit cropped and the sleeves are ruffly, but considering my shape (pear), it is a perfect silhouette for me. The pattern (Simplicity 8417) is meant to include a ruffled (nearly peplum) hem, but I decided to nix that and keep the bottom simple. 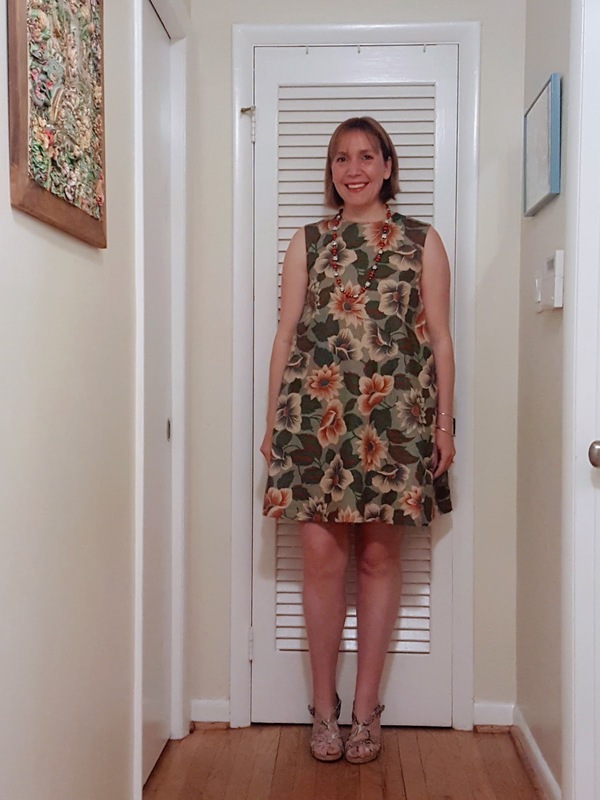 It works for this garment, but I would like add the gathered bottom bit the next time I make the top (maybe in a sweet lightweight knit fabric?). The poly charmeuse I used is sold out, but this fabric could work in its place for a look that will intrigue. I decided to go even further with my craftiness, and with a quick stop at Joann's, I made a necklace to match the outfit completely. I really like making the necklace, so maybe there will be more matchy-match jewelry in the future, too! Upon returning from Germany, I made the decision to execute another make, this time in preparation for the school's annual auction. 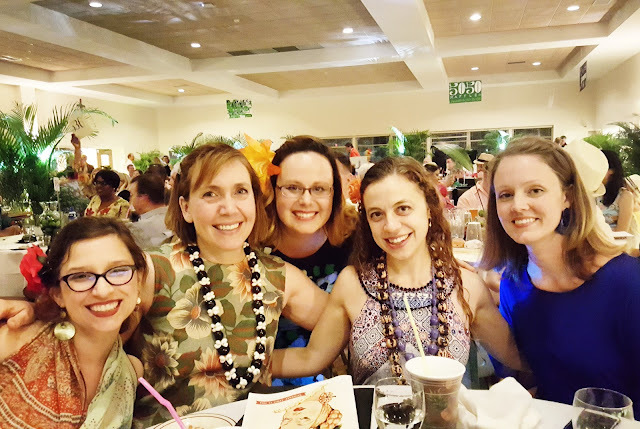 This year's theme was "Copacabana," and we were all meant to wear retro Rio/Hawaiian themed clothing. Of course I was all, "I'm gonna make something!" Rather than go traditionally bright with my color scheme, I chose to use this beautifully colored, but subdued printed fabric instead. I felt it read more "retro" and something that would have been seen on fancy traveling women to warm places in the 1950s and 1960s. Sadly, this cotton/linen blend fabric is not available (it is awesome for this pattern). I recommend this one as an option. For the dress, I ended up choosing a Vogue pattern from Summer 2017, Vogue 9237, and though it is very simple, the effect of this silhouette with a beautiful printed fabric is stunning. The ruffled hem at the back also makes for a great "exit." LOL. 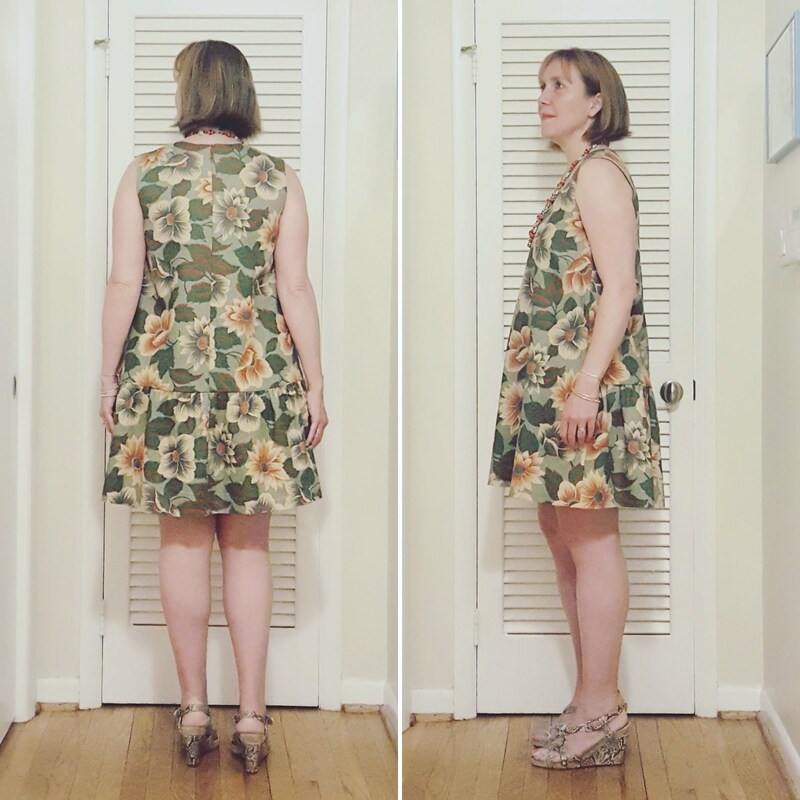 I chose to make a small, and this fit fine throughout, even though my hips measure at a large. The only real adjustment I made were for my very square shoulders, and that adjustment was needed. 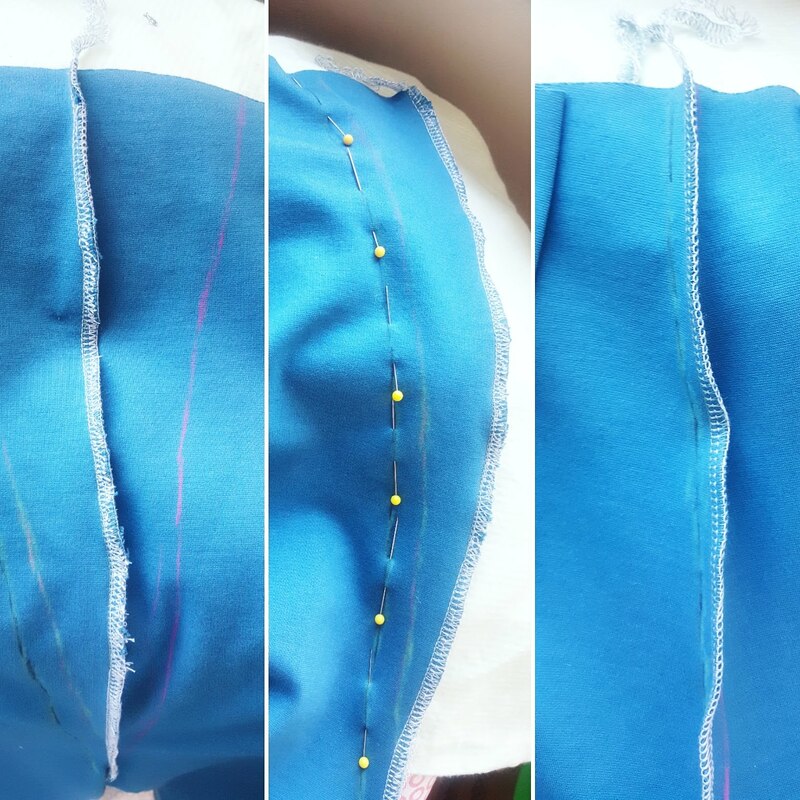 The facings are non-existent, so I decided to draft my own, and they fit the pattern well, so I am glad I went that route (I hate bias strip facings). Here I am with my fly women, some of my most favorite in the world. It was a great auction, and our festive frocks really suited the night. I hope all of you are well. I plan to be back in July! The Hawaiian print dress is so fun and this green is such a lovely color on you! 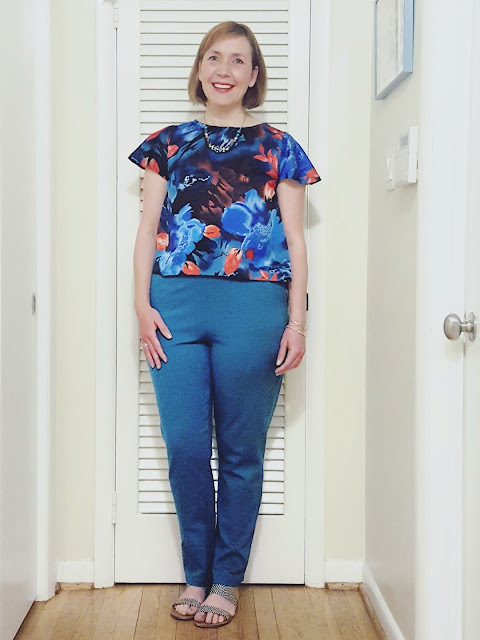 Way to persevere with the fit on the pants--they turned out great and look so nice with the floral top!